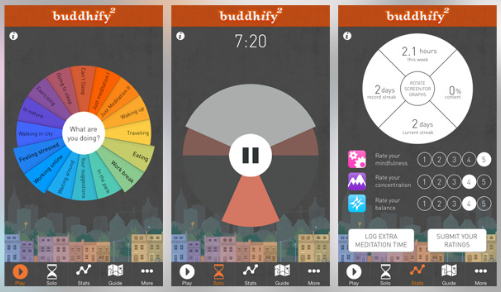 Buddhify is a mobile-based mindfulness app intended to help users fit meditations into their daily routine. Attractively designed, Buddhify provides suitable guided meditation exercises targeting different situations common to most people (“at home”, “being online”, “pain & illness”, etc.). For each situation, the user can choose from 3–6 exercises that vary in duration (4–30 minutes long, averaging around 8 minutes). Additional features include a solo meditation timer with no guidance for more experienced meditators, and a personal meditation tracker that monitors meditation activities over time. Offers mindfulness practice for different situations in the user’s daily routine/ Appealing graphic design/ Reasonable cost. Lack of guidance for first-time meditators/ Does not motivate users well. Buddhify has a very appealing design and users can potentially enjoy the different meditations offered for various situations. For the first-time user who is not familiar with the technique, however, Buddhify does not offer training or a familiarization path. Furthermore, the app does not provide motivational encouragement for ongoing use or an explanation of the technique and its advantages. Altogether it seems that Buddhify is more suited to users who are already acquainted with mindfulness and who have previous knowledge of its benefits. The guided meditations are pleasant to listen to and the program is easy to use. However, if users prefer to use meditations for only one specific situation, they might find the lack of variety in exercises challenging. Buddhify is (at the time of evaluation) more affordable than meditation applications that received higher quality scores; however, it does not provide users with a free trial. Buddhify can be useful as a supplementary mindfulness meditation exercise for patients experiencing distress. It could be added to treatment in cases where relaxation techniques and meditation practice would benefit the patient but are not covered in-person for a variety of reasons (e.g., lack of time, or focus on other issues). Clinicians who become familiar with the app can educate their patients on the advantages of mindfulness practice and help patients plan situations in which to use Buddhify. Because of its affordability, patients might prefer to use this app over other meditation apps.